This week we’re big on little. Claire knows how to write a step by step how-to. 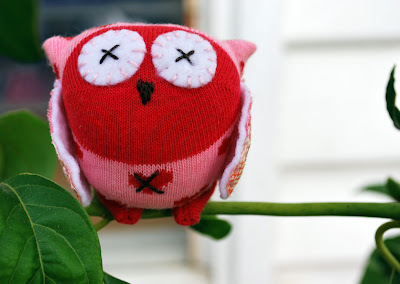 I will happily vouch that making a baby sock owl using one of her kits is ‘easy as’. With all the knitty business happening chez M&E, it was lovely to take a break from pattern repeats and indulge in meditative bird sewing. Actually biggish single quilt given the recipient is still of an age counted in months (another moment of startling intelligence on my part, crafting a generous deadline). I’m sure I have been (nicely) bullied into this. I ’fessed up to my beginner quilting ineptitudes and whaddayaknow, there’s a Perle 8’s basting party happening next week. DO THE GIRLS KNOW HOW TO PART-AY! All partying persons welcome, by the way. First begun back in 1926 (basically), I have remarkably located the quilt top bit – minus one piece of edge. If anyone is exasperated with my ongoing ineptitude, then imagine how I feel. No, I haven’t the foggiest if I ever even had a quilty bottom bit. In the last week the small of the house declared ‘I growed up’ and promptly turned teenage. She’s flouncing about wearing inappropriate off-the-shoulder clothing (mine*), slamming doors, ending every second sentence with SHUDDUP!, and telling everyone she is sixteen with a conviction eerily believable. If the real sixteen is anything like the pretend sixteen, I’ll cut to the chase and draft the letter of resignation now. The ‘earthmother’ in me is taking a little holiday this week. * Not generally because my clothes are an off-the-shoulder style, mind. I live with an 8 year old youngest princess who reckons she's 18. It's interesting to say the least. that teapot is utterly divine- and the owl is super cute too- I also think the quilt is looking gorgeous. I'm sure I've still got quilts that came over on the First Fleet that I haven't finished yet! how amazingly sweet is that teapot. What a picture of your daughter, I love it! What a wonderful little teapot, and the cutest little sock creature! I have an almost-three-year-old who thinks she's about sixteen or so, and I am quivering in my socks thinking about the real sixteen! 'cyooooot!!' the mini teenager (2yo) next to me is squealing! This morning she told me I was schoopit when I was struggling with her seatbelt. She definitely thinks she's all growed up too. 16 huh? How funny! I used to teach Pre-K. It must be something about that age because my students were obsessed with becoming teenagers. That and High School Musical. The teapot and owl are adorable! The teapot is perfect! Imaginary tea parties are the only way to go. I'm glad my 10-month-old can't talk yet, although she's made it clear that she wants to go everywhere that Daddy goes! There must be something in the air because the attitude I am getting in our house is vile. Squealing over that adorable teapot and owl! And, oh, my, little ones get such wild notions in their heads. It's a good thing they are cute...not sure what's going to save them though when they do turn 16. I'm thinking it won't be their cuteness. I think you are lucky you live far far away from me or else your teapot and owlie would magically disappear and I would have no idea where they went.. but you might never be able to come to my house. Love the little owl and that teapot. Oh, the owl... and the teapot... too beautiful Tania. Love the little teapot and owl and what I can see of the quilt looks lovely! love the teapot...I have the same going on here with a three yr old girl turning more Bratz than Doll. Peuter Pubertijd ! You're now giving houseroom to a Toddler Teen . Almost more awful than than the real thing ... their taste in music is worse , for a start. Just keep on drinking soothing cups of tea and this too will pass( had to correct that last word . I'd left out the a ). Oh I love the teapot! It is just adorable! Wow kids really grow up fast. You deserve a holiday! I work with teenagers everyday but I'm just lucky I get to give them back at 3:30pm! 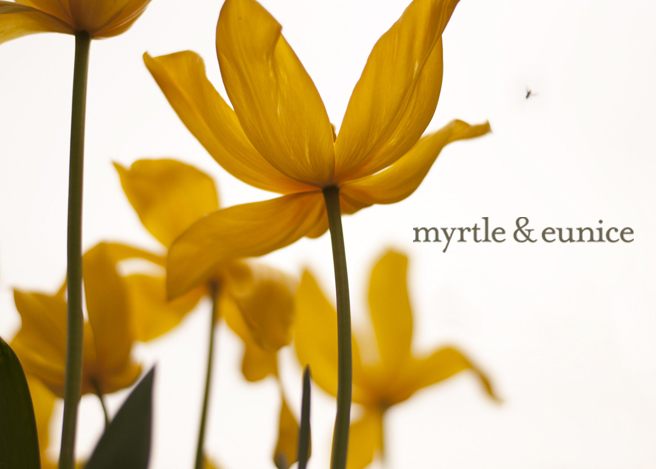 What lovely little things in your space this week, maybe excluding the last one. But if I had just looked at your pictures and not read the words, I would have remained in awe of your little things. The questions is, how off the shoulder is she? A chip perhaps? The. teapot. is. killing. me. i actually had a little heart palpatation when I saw it! The quickest way to give Busy the cranks is to call her 'little' or even allude to the fact that she is young... she loudly proclaims "I AM BIG!" why do they want to gorw up so fast? Teapots! I have just about all Jean Greenhowes books. I've made that tea shop set - mine looked pretty much like the one in the picture, not very good at changing the colours! There is a little dumpling misters one as well. I made the green grocer from that - including knitting a sack of potatoes! I can offer no words of wisdom on threenagers, just wish you luck and fortitude. little things make life more joyful! your little owl is big cute. Love the 16 year old in the making. It's funny how you can find these things adorable in other children but when it's your own... oh no! xo m.
I once knitted half a Jean Greenhowe mouse before my sanity was restored to me. That teapot is adorable! As is the little owl! Good luck with your new "teen", hope it doesn't last long! I have two words for you. A bit of photoshop action on her birth certificate, pack her a bag & you're sorted! Love love love that teapot. Too cute! That teapot is too cute! as a parent who 'survived' the teenage years (two girls 21 and 24) i didnt' find them as bad as they were painted. gorgeous teapot ... i suggest adding a little medicinal brandy and a very long nap ... but i can't decide who should take the medicine! Love the teapot. And the little teeny bopper in the making is too funny. I have one of those myself. It's easy to laugh now, but I know I won't be laughing in a 10 years when it becomes a reality. That teapot is so cute! Eep... teeny tiny teapot is squeaky cute. I've just been told in a stern (4 year old) voice "DON'T talk about the time!" When I began a sentence that looked like it was headed towards "it's after your bedtime and you're not even in pyjamas". 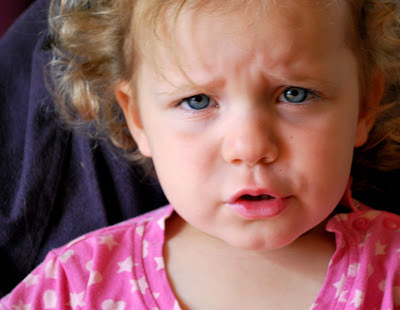 To use her (2-year-old)words, "Bwuddy How!" - what hope have I got for 16 and riding in cars with boys? I think your little horror is still pretty cute. 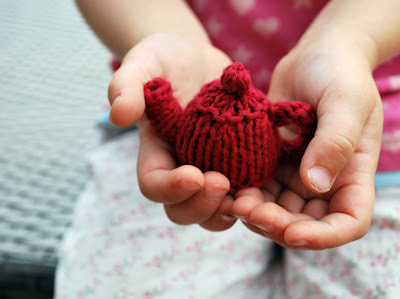 So much to love in this post, wishing I could knit but only long enough to make that wee teapot! Our smallish one has just turned 5 and is demanding the keys to the car, "I'm going downtown!" says she. That teapot just stole my heart! I don't think I've seen one like that, and how simply adorable. I made one of those owls before, aren't her patterns great? and some difficult sometimes :)But who could resist these beautiful blue eyes! I can't believe for one second that that sweet little face could cause any trouble..
PS - need a copy of that teapot pattern - it is so so cute. The teapot is adorable!! 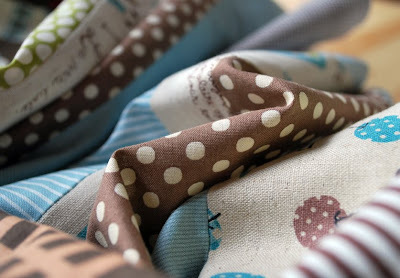 I am loving the fabrics in your quilt - browns and blues, a winning combination. Awww Tania thanks for the kind words! My earthmother takes regular breaks, sometimes she just packs up and leaves without telling anyone. Hope the small is back to her smiley self! so many cute things happening, the quilt looks pretty gorgeous too!! You have to be aware of those bullies with rotarty cutters, we are scary people!